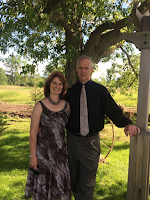 Living on a reserve in a northern Saskatchewan post has given us many new experiences. This past week I was asked to TEACH a grade 5/6 class and I did. Interesting! 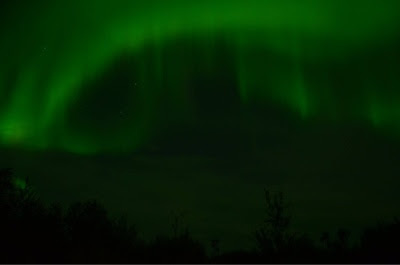 Last night Ron called me from work and said that the northern lights were dancing so he arrived to pick me up in the police truck to go and see the best skies yet. Today he went to pick up our slippers made by one of the ladies here. Made out of moose hide and fur to fit us personally. 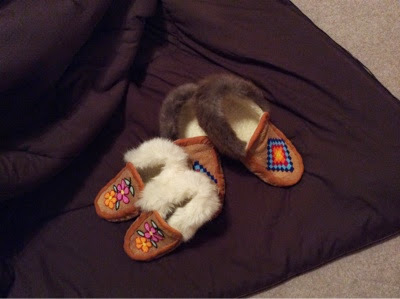 The bead work is very detailed and the fleece lining makes the slippers perfect for the winter months ahead. And then tonight Ron calls to say that Staffing is coming to talk to him on Monday. This will start the talks about where we will end up next summer. More interesting times ahead! And that is just a little this and that!